Porsche. Unlike any vehicle, you’ll ever drive. And we are like no other dealership you’ll ever visit. 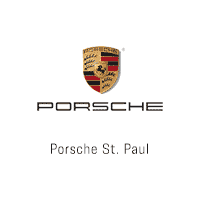 Welcome to Porsche St. Paul, your local Porsche dealer serving the eastern Twin Cities area and western Wisconsin. We are here to take care of all your Porsche motoring needs, from Sales of New and pre-owned Porsche models, Porsche Approved Service and Parts. Select pre-owned vehicles include the Porsche factory-backed Certified Pre-Owned Warranty, featuring guaranteed Porsche parts and an extended warranty for total “peace of mind” motoring. Please come and see our expanded inventory and service and parts departments. Please note, we have changed our phone number to: (612) 999-1007. Our Porsche-trained professional sales, service and parts staff is fully committed to ensure you receive the level of personalized service commensurate with the Porsche brand. Our team will always put you first. We bought a CPO Cayenne diesel working with Dave Wilson. Dave has become our new benchmark for the person we want to buy a car with, not just from. Lukas Johnson handled all the closing details in a very professional manner with no pushing when it became apparent we weren't interested in additional services. Thank you both. We have been going to Porsche St. Paul for service for years. Justin Hueg provides great knowledgeable customer service. Justin referred me to Dave Wilson in sales when we considered a new vehicle. Dave has years of experience. His easy laid back approach is welcoming and refreshing. Dave was always available and responded to me even on his off days. We received exemplary service from Jerry Klin at St. Paul Porsche. He was professional, efficient, and went the extra mile to make sure we had the best experience purchasing our car. I have purchased yet another vehicle from Porsche of St Paul. I have always had outstanding experiences through the years and my recent visit was no exception. David Wilson did a remarkable job as my sales person. He went out of his way to make certain that I was pleased not only with my new Cayenne but also with the service he delivered to me. Simply outstanding young man. I will be back!